Professional success, more often than not, means becoming a manager. Yet nobody prepared you for having to deal with messy tidbits like emotions, conflicts, and personalities-all while achieving ever-greater goals and meeting ever-looming deadlines. Not exactly what you had in mind, is it? Don't panic. Here are the tools to help you succeed and even thrive as a manager. Drawing on the Myers-Briggs Type Indicator, Zack introduces two primary management styles-thinkers and feelers-and guides you in developing a management style that fits who you really are. Zack takes you through a host of potentially difficult situations, showing how this new way of understanding yourself and others makes managing less of a stumble in the dark and more of a walk in the park. 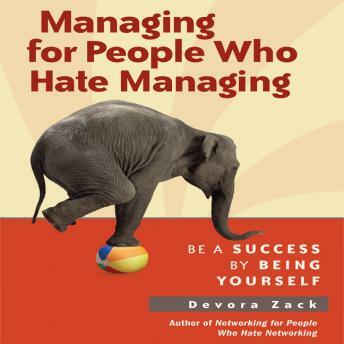 With enlightening examples, helpful exercises, and lifesaving tips, this audiobook the new go-to guide for all those managers looking to love their jobs again. I took away several mental notes and have used a couple suggestions on how to read people at work. The book gave made me a little bit more confident in my leadership skills but I will need to read another book. I feel I need more. They narration is a big flat but the book it'self is quite witty.